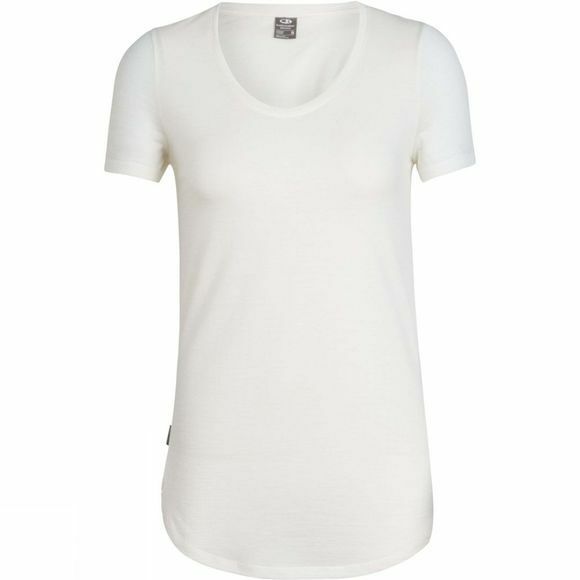 The Women's Solace Short Sleeve Scoop T-Shirt from Icebreaker is a relaxed-fit tee for laid-back, everyday style with the essence of comfort. Made from our ultra-lightweight 130gm jersey Cool-Lite fabric, it’s a silky-soft blend of merino and natural TENCEL to keep you feeling great, all-year-round. It also features corespun technology, where the fibers are wrapped around nylon for extra durability, strength and next-to-skin softness. Designed for great comfort and fit, it features a set-in sleeve construction, and dropped front and back hems for extra coverage. The feminine scoop neck is a flattering and practical touch, whether you’re hitting the festivals or stocking up at the farmer’s market.